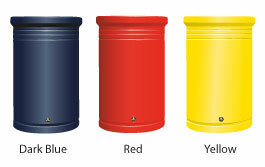 An attractive economical open-topped litter bin available with a choice of sack retention belt designs. Perfect for children’s outdoor play areas, such as playgrounds, parks, nurseries or primary schools. This economical litter bin with sack retention belt is ideal for busy playgrounds. The open top design makes it easy for children to "hit the target" every time. Available with a choice of sack retention belt designs, either a Dinosaur design or a 'Please Keep Our School Tidy' design to encourage children to dispose of their litter.